The International Directory of Logicians is a listing of over 260 of the world's most foremost living logicians, representing the most important and influential developments of our day. 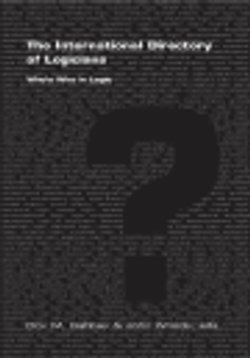 It provides a compact summary of each entrant's eduction, professional appointments, honours and awards, principal publications, as well as a description of the nature and significance of his or her contributions to logic, and a "vision statement" concerning logic's future prospects. Logic here is understood in its broad sense, encompassing all branches of mathematical logic, philosophical logic and the history of logic. Inclusion in the Directory is by invitation only, following a rigorous selection process guided by a distinguished Advisory Board. The Directory is designed to meet the needs of students and professional logicians alike. It is the most informative single-volume record of logic's present state and will serve as an invaluable historical reference for future generations of scholarship.